SAN FRANCISCO— Television cameras caught him trying to stay up and loose between innings. Roy Halladay rarely rested, as he spent time riding a stationary bike after pulling his groin in the 2nd inning of Thursday night's National League Championship Series Game 5. Halladay was tough, throwing 6 innings, to help the Philadelphia Phillies extend the NLCS and return home to wrap up the series this weekend. Halladay's teammates didn’t quite realize their starting hurler was pitching through pain in his game 1 rematch against San Francisco's reigning Cy Young Award winner, Tim Lincecum. Learning that Doc pitched while ailing impressed his teammates more than they typically are with a Halladay outing. Some found it difficult to describe Halladay's efforts. "I don't know what word you can put on him. Do you want to use 'Superhero?' That works," Shane Victorino told the media following the game. In his 6 innings of work, Halladay allowed just 2 earned runs on 6 hits and 2 walks, while striking out 6. His counterpart, Lincecum, allowed 3 runs (2 earned) over 7 innings, while striking out 7 and walking 1. 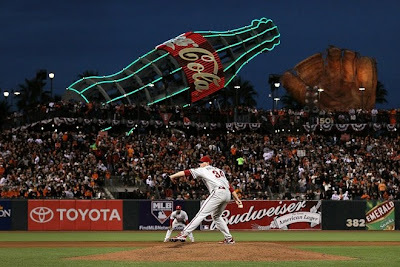 The Giants took a lead in the first inning, when a potential inning ending double play ball hit by Buster Posey wasn't turned by Chase Utley, instead the Phillies got just one out on the play and Andres Torres scored, to put San Francisco up 1-0. The Phillies would do most of their damage in the 3rd inning. Struggling Raul Ibanez kicked off the rally with a single to right field, followed by Carlos Ruiz reaching after being hit by a pitch. With two on and no outs, Halladay was given the sign to bunt the runners over. Halladay then bunted the ball off home plate, and it trickled toward the opposite batters box. Rookie catcher Buster Posey pounced on the ball, that was foul and ruled fair, and threw to third, but Pablo Sandoval missed stepping on the bag and Ibanez advanced safely. Halladay did not run for first base, as he thought the ball was foul and he was easily thrown out at first base. With runners on second and third, Shane Victorino slapped a ball toward first baseman Aubrey Huff, who was unable to handle it. They ball got away and allowed Ibanez and Ruiz to both score. Placido Polanco then followed with a single to center that plated Victorino, and extended the Phillies' lead to 3-1. Lincecum went on to retire the next 11 Phillies batters that he faced. New Phillies nemesis Cody Ross drew the Giants closer with a run scoring double in the 4th inning that brought home Pat Burrell, to shrink their deficit to just 1 run. Before Brad Lidge entered the game to earn the save for the defending National League Champion Phillies, his teammate Jayson Werth padded the team's lead as he pounded a lead-off homerun off of righty reliever Ramon Ramirez. In a series where pitching has been so prevalent, the Phillies have posted a .209 batting average while the Giants are batting .220 in the 5 games. Halladay missed some time last June with a groin injury, so he's familiar with the pain and discomfort in that portion of his body. He doesn't think this injury is of the same severity as the one that cause him to miss multiple starts with the Blue Jays in 2009. "I don’t think it’s anything real bad," Halladay told the media. "I was able to continue pitching and it didn’t get worse. I’ve got some time to rest."